Niki's 3rd birthday was the 12th and her party was the same day. (I'll have to insert a post for that, come to think of it.) Among her many presents was a Toys r Us gift card, from her aunts Lori and Anita. 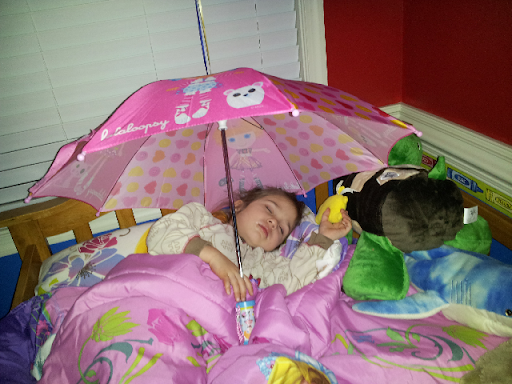 We took her shopping on Saturday and she bought a few things, including an umbrella and a little yellow buddy. None of that left me missing my youth. Even putting her to bed and sensing the photo op had me feeling the warm and fuzzy of a proud mama.